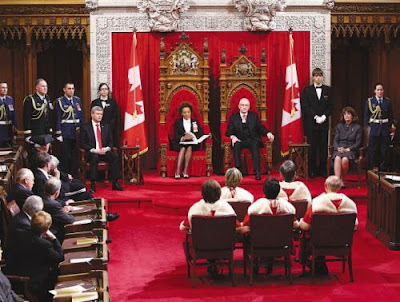 Senators, members of the Supreme Court, Prime Minister Stephen Harper and Jean-Daniel Lafond listen to Governor General Michaëlle Jean deliver the speech from the throne in the Senate chamber on Parliament Hill in Ottawa on March 3. Columnists Melynda Jarratt and Don Chapman are disappointed the speech did not address what they see as discrimination within the country’s citizenship rules. They say the act limits immigrants whose connection to Canada is through female family members. With International Women's Week approaching, we weren't surprised to see the Harper government take advantage of Governor General Michaëlle Jean's speech from the throne to make an announcement that would appeal to women. We were surprised, however, to discover that the Conservative plan to even out the patriarchal playing field consisted of striking a Parliamentary Committee to study proposed changes to our national anthem! While he has since abandoned that idea, Stephen Harper was so concerned about gender discrimination in Canada that he wanted to replace "In all thy son's command" with "Thou dost in us command." We suggest that when it comes to gender discrimination, Harper has a lot more to be concerned about than five words in our national anthem. Right now, we know of at least 100 Canadian-born men and women, their children and grandchildren whose citizenship is not being recognized because of gender discrimination that is openly practiced at Canada's Department of Citizenship and Immigration (CIC). Not only is it a flagrant violation of Canada's Charter of Rights and Freedoms, but it contradicts the spirit of numerous United Nations Conventions on Human Rights to which Canada is a signatory. This is how it works: if your connection to Canada is through a female Canadian - a grandmother or mother - your application for citizenship will be turned down. But if your Canadian connection is male - grandfather or father - welcome aboard. No politician today would dare support gender discrimination against Canadians and expect to win an election, but here we are, in the second decade of the 21st century, and Citizenship and Immigration Minister Jason Kenney defends this discriminatory practice and even endorses it by refusing to change the offending sections of the act. The victims of this gender discrimination run the gamut from young and old, male and female, Canadian-born and foreign-born children of Canadians. They include 88-year-old Quebec-born Second World War veteran Guy Vallieres, who died in February 2009 waiting for his citizenship to be recognized. The act also impacts three year-old Casey Neal, a cute little toddler who was born in the United States and whose application was turned down at Christmas because her Canadian connection is through her grandmother. Yet Casey's adorable little cousin, two-year-old Darcey Miller, who was also born in the United States, had no problem obtaining his Canadian citizenship last year because his Canadian connection is through his grandfather, a male. Hon. Lorna Milne: "Honourable senators, it is International Women's Week, in 2009, and this Conservative government is still actively discriminating against women... I will tell you how. "Less than a month ago, a Canadian World War II veteran - if you want to hear about Canadians who served our country - died while still disenfranchised in his own country. "The only reason for his disenfranchisement is that he was born to a Canadian mother and an American father. "Due to the arcane provisions of the Citizenship Act, it is much easier to obtain and regain Canadian citizenship if your relationship to Canada is through a man instead of a woman. "Can the Leader of the Government in the Senate explain why this Conservative government, in 2009, still holds the view that a father's family is more important than a mother's in determining citizenship?" Can the prime minister explain why, in 2010, Canadian citizens are still being discriminated on the basis of gender by CIC? And during International Women's Week, as progressive women and men gather to celebrate women's achievements, can the many activists who know about this issue explain why they have not come to the defense of their sisters and brothers who are the victims of gender discrimination at CIC? Melynda Jarratt is a Fredericton historian and authority on Canadian War Brides who is writing a book on the Lost Canadians. Don Chapman is the leader of the Lost Canadians.